Nothing that we experience or do occurs in a vacuum. All of our lives are a result of the efforts of countless others, and all that we do has a ripple effect on this world in which we dwell together. So I have appreciated needing to use the local laundromat, because it has reminded me of the importance of community. In my white, educated, professional culture, I can exist pretty comfortably based on the hard work of lots of other people, most of whom I will never come into contact. Factory workers who built my car and work in oil fields to produce the gasoline that powers it; migrant farm workers who work the fields and facilities that some of my food comes from; factory workers who produce textiles and other home goods that fill my house. There are many, many people whose toil contributes to the comfort and ease of my daily life. So why am I going to the laundromat if I could afford to buy my own washer/dryer? Technically, I have a washer and dryer, but they *might* be original to the house (think 1960), and the washer is broken. The dryer works, and I’ve used it a few times, but 1) it is SO loud it sounds like the screeching of metal in a high-speed train crash and requires me to wear my earplugs when it’s running, and 2) now that it’s hot out, I can dry my clothes quickly on the line without wasting the electricity. I want to re-finish my laundry space within this next year, so I don’t want to buy a washer or dryer until I really know how I will design that area adjacent to my kitchen. So I’ve been going to the local laundry about once every two weeks to get the job done. I think when we have more money and can “take care of ourselves” pretty easily, we sacrifice the sense of community that comes by virtue of needing to share something with a lot of other people. There are people I see at the laundromat that I guarantee I would never interact with otherwise, except for in that humble place where we literally air our dirty laundry. (Actually, hospice chaplaincy exposes me to quite a diverse population, but that’s another post for another time.) One of my supervisors includes me in a lot of interview panels as we hire new staff. When she emphasizes the sense of equality that we share on our team between the varying roles, she always says, “None of us is better than the other–we all put our pants on one leg at a time…” And that’s how I feel at the laundromat. (Apparently we all take our pants off one leg at a time, too.) We all have dirty laundry; we all need somewhere to scrub it up and move on with living life. Dirty laundry is really a great equalizer of humanity, and laundry is a communal activity in many parts of the world. In many countries, women catch up on the gossip while gathered around a washtub or pool of water where the laundry gets done. I recall my time studying abroad in Kolkata, India. Our professor reminded us that we could send away our dirty duds to be washed and pressed and returned by the same afternoon, though he cautioned us: “The laundry ladies literally will beat your clothes against a rock down at the creek, so if you have anything with buttons or that you really care about otherwise, don’t send it.” Surprisingly, those Indian laundresses also had some secret to getting whites as white as I’ve ever seen them, short of being brand new out of the package. 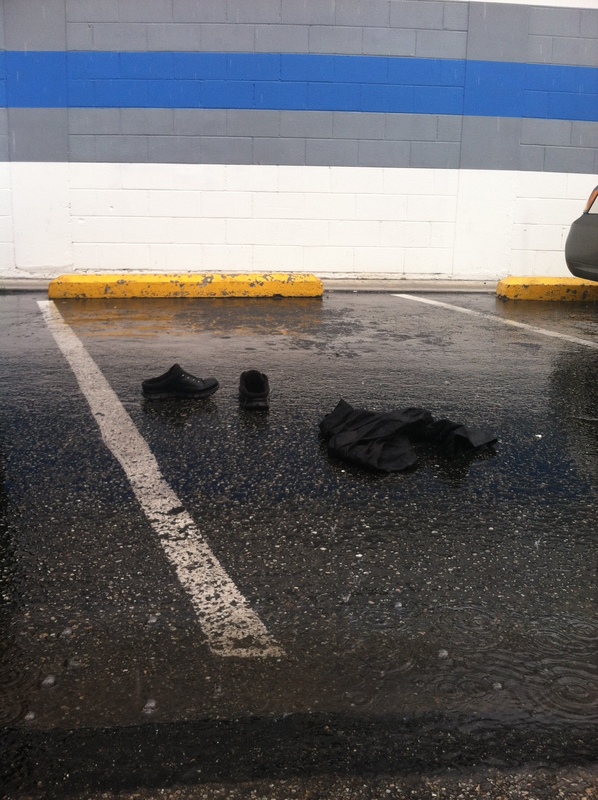 At my laundromat, there was a time when I saw a man unloading his wash from his car that was parked next to mine. It looked a little unusual–there was some kind of exhaust pipe coming through the roof of the old minivan. When I looked closer, I realized that this man lives out of his van. The lightly tinted windows revealed how he had retrofitted the inside so that he could fully recline to sleep, and he could cook on a little stovetop inside. Obviously he was at the laundromat doing his wash before moving on through and out of town to wherever his next destination lay. I live in a very diverse neighborhood. Susan says that there are around 30 different languages spoken in our part of town. On my nightly walk around the park, there is always a large group of Southeast Asians playing volleyball and soccer. It reminded me of the huge city park in New Brunswick, NJ, where I did my residency. My fiance at the time and I played a lot of tennis there in the spring before we got married. We called it “the United Nations of municipal parks,” because it was so incredibly diverse. The Dominicans played baseball; the Japanese played tennis; the Indians played cricket; the African-Americans played basketball; and the Latinos played soccer. I wish that I came from a culture that valued community to that degree–that I had some kind of ethnic connection with dozens of other kids and families and could spend recreational time with them on a regular basis. 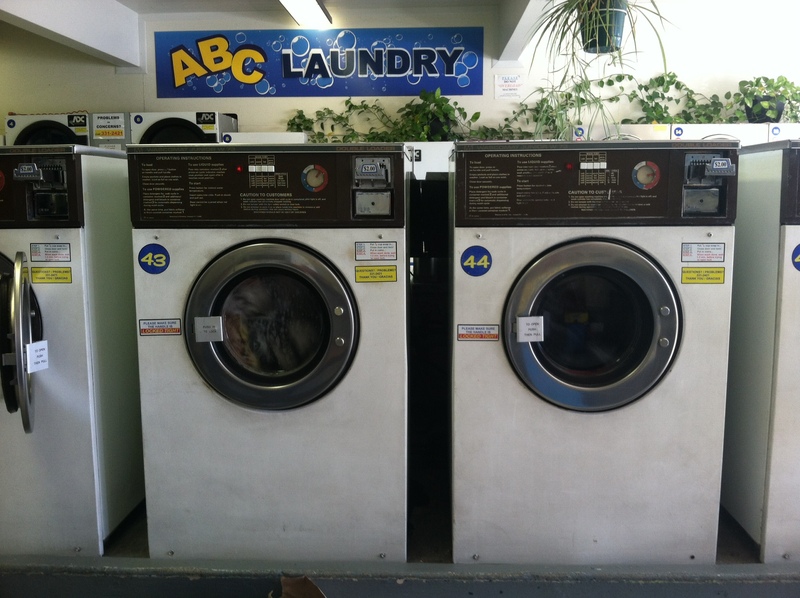 At the laundromat, there are usually several muslim women wearing headscarves, and many Mexican men washing up there work clothes–usually by that point just wearing a white tank top and their many tattoos covering their muscular arms. It’s good to put ourselves in positions that humble us and where we feel a little vulnerable. The first time I went to the laundry that song popped into my head, “One of these things is not like the other…….” I felt sort of nervous that I didn’t quite know how everything worked, and I was kind of afraid of making some idiotic mistake and being the “over-qualified” person who would need to ask for help just to turn on my washing machine. Or what if I started using “someone else’s” machine without knowing it right before they got there–kind of like when a new person comes to church and is afraid of sitting in “someone else’s” pew. Fortunately everything went fine, but I was definitely aware of how comfortable my life is on a day-to-day basis, and how sheltered I am by living alone and not really “needing” to be around many other strangers if I don’t want to be. Most people in this world don’t have the luxury of personal space–they live in small dwellings crammed with a lot of people in village-like settings. Again, ultimately I long for that kind of community where people are truly dependent on one another, and yet I confess, I love having a house all to myself–to experience solitude and peace and quiet as part of my daily lifestyle. I fully expect that eventually I’ll buy my own washer and dryer set and get back to my routine of doing laundry at home. But I also expect that I’ll miss the little cultural exchange that is going to the laundromat. 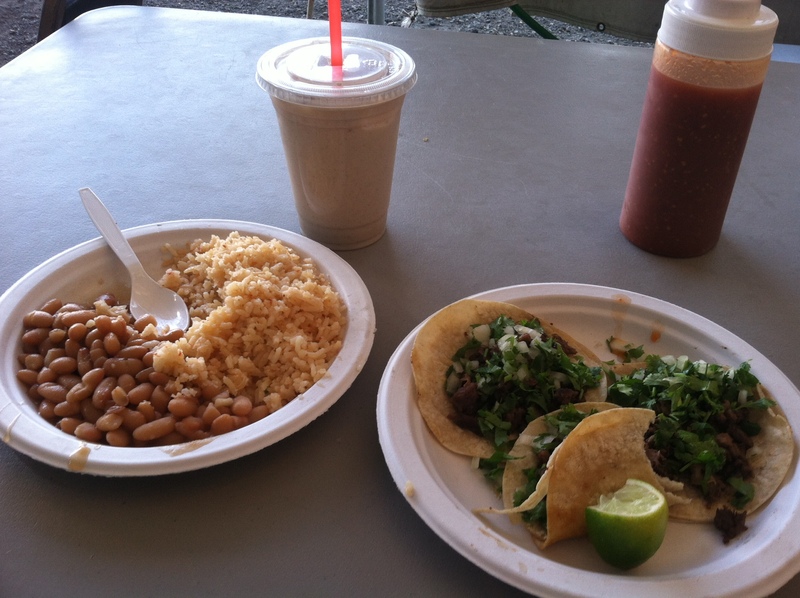 PS: One final perk about going to the laundromat is that there is an awesome Mexican taco stand right next to it. Dee-lish.